This Tough1® Turnout Blanket is an economical way to keep your horse warm and dry. Waterproof and breathable, it features a coated 420 Denier poly outer shell with taped seams, seamless spine, and 150 grams of polyfill, designed to allow moisture vapor to wick away from the horse and prevent sweating while retaining body heat and repelling outside coldness. The 210 Denier poly lining prevents rubbing and helps to keep the coat shiny while preventing hair, shavings, and straw from sticking to the inside of the blanket. Note: Not recommended for horses that bite, chew or rub on blankets or for horses turned out with a companion or in a group. Material may tear or rip if caught on a nail, rough fencing, or thorns from bushes. Just what was needed.for a less than careful srud horse. Great medium weight turnout blanket, especially at the price.Tough enough for my TB stallion. inexpensive, but durable. nothing fancy, but keeps our guys warm ! its light weight and a good price. Great blanket so far and keeps my mare super warm. She wears a 75-76 in all her other blankets but this was a bit tight across her shoulders. It’s not terrible but not as great a fit as her others. She’s a petite thoroughbred for reference. Great price and a perfect backup blanket for the second half of the winter season for her. I love it. A nice blanket for the price! Great blanket! Fits well and is perfect weight for our climate. Fit is good and it’s a nice lightweight 150g. HOWEVER, my horse is in a pasture by himself and the horse next door STILL managed to shred my horse’s new blanket. If I could include pics I would. This particular blanket is only good for horses who are quiet and mind their own business. Very nice turnout blanket I put it on top of a heavy stable blanket for one of my senior horses. That way he has extra warmth and it’s water resistant. Shell is very thin and not very durable. It had several large tears within one day of wearing. Thank goodness I'm handy with a needle and thread, but I don't expect this to last more than one winter. The blankets I recently received from State Line Tack are ideal for, my stallions. My horse has a very nice stall and insists on standing in the rain. This keeps my horse dry and the chill away. It also makes an excellent top sheet with a lightweight blanket under it for the few nights of hard freeze we get. The outer layer gets damp/wet on the surface and the under layers don't get soaked. No blanket/sheet I've seen is totally waterproof, however, this one comes closest. Best of all is the neck - it comes forward enough on the shoulders and doesn't slip back. If your horse doesn't like materials that make noises, you might want to take an extra few moments to get them used to the "shush" noise this blanket makes. That's the only thing my horse doesn't like about this blanket. Nice blanket but very thin! The overall product is nice, however, the material is very thin and rips very easily. My mare is not typically rough on blankets at all and has managed to put three rips in this blanket. I now use it as a base layer for her full body sheet! Fits great, resists water and stays in place. Great rug for the price and would buy again. Love the great color choices too! Always high quality and last! It fit great. And looks awesome on my horses. The price was fantastic. Nice light weight Blanket. Bought it for the color so my brown mare wouldn't look like a deer during hunting season. Bright pink! Very happy with this blanket! Love this blanket. Nice weight, good waterproof fabric, I like the fleece at the wither area, nice hardwear, fit well. 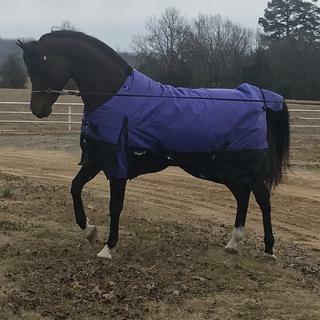 Nice blanket for the price / fits my old thorobred well / he goes out in field with many horses and it was intact / nice for in between sheet and thicker weight blanket / don’t know how would hold up if your horse rough on blankets,my boy is not. I love these turnouts and this store. Great blanket. My horse is not hard on blankets so I don't know just how tough it is. However it kept him warm and dry after a cold day outside with 3.5” of rain. He stood under his cover most of the time but it was also windy with rain and he stayed dry. Just what I needed. Love the longer sides that wrap around underneath to hold in the belly warmth. Perfect for my horse, keep him warm during these really cold days! The first day my horse ripped the buckles in the front. Another coat tore from light nipping by the neighboring horse. Very poor quality. I would never buy again. Weatherbeeta is the best equine coat. Great blanket at a great pricw! I'm very happy with this blanket! This blanket was everything I'd hoped: fit my Andalusian/ Percheron cross perfectly, (no rubbing/no slippage); kept her dry and warm through a tough winter; and washed up beautifully! Tough-1 are the best blankets I have ever used. The neck cover and the blankets are better than other more expensive blankets I have purchased in the past. Excellent medium weight blanket. Fits true to size and gernerous in the right places. I love this blanket for my imported german riding ponies. It fits great and no rubbing anywhere. It is a good medium weight blanket for the CA winters. Although can rip or tear if they rub it on a sharp object. Otherwise excellent product. Best blanket on the market, for the money! I have been extremely impressed with the Tough-1 turnout blankets. They have yet to disappoint me and the durability cannot be beat for the price. I originally started buying them for my growing filly because they were so inexpensive, and now they are my go-to turn-out blanket. I especially love the high-neck options out there for those who don't quite fit the full neck appropriately. Was true to size and very durable. Will highly recommend and continue to use. I live in Texas so I don't need it often but when I do it works nicely! Holds up well, fits great. Can't complain at the price either. A nice medium weight blanket for the price. Fit my QH really well. Not warm enough for temps below 10 degrees but fits well, attractive and has held up on my most frisky horse. I will add a fleece liner for the worst of winter. I would buy it again. Fits nicely and bright color makes it easy to spot your horses in pasture. Seems to repel mud and stay cleaner than some of the blankets we have had previously. Light weight makes it an excellent product for areas where there is a lot of daytime warming but nights can be quite cold. We do not get a lot of snow but a waterproof sheet with some insulation is a requirement for prolonged periods of cold rain or sleet. Even with a warm shelter, our horses will always be out in the elements to chase down those last blades of green grass all winter long. I usually get McAlister blankets & they last around 5-6 years. This one was only slightly less expensive & nowhere near the quality. The fit is very large too, if you are going to purchase one go at least 2" smaller for a good fit. (ie: If your horse usually wears a 78", get a 76")It's better than nothing but I will go back to McAlisters next year. Rated Excellent being that it is Exactly as described. Love it! I have two of these blankets and just bought a third. Read the description carefully. This is a light weight blanket, it gives wind protection and rain runs off well. We live in south Georgia so it doesn't get extremely cold here but helps give added protection when needed. I do miss not having velco along with the buckles, otherwise I really like these blankets. Kinda like a lined windbreaker for horses. This blanket fits my horse perfectly. This is the second one of this brand that I purchased. This is lighter in weight than what I'm used to, but I only blanket on extremely cold days, so this is only used as additional coverage to my horse's normally wooly body. Love the available colors and the price was very reasonable. A blanket only lasts 2 seasons for me, but well worth it. Awesome blankets for Northern California They are pretty long on my short quarter horses but the never stepped on them or ripped them They came unbuckled on one of my horses but I used rubber bands to stop that Great value and happy horses!! My daughter loves the blanket. She is going to use it on the beach trip with the horses. It seems to keep him warm. I bought this for my horse and the first one I received got a hole in it and tore apart in the first week. I was upset but called and told them about it and they apologized and said they would send out a new one. The one they sent out they had a letter in it that said the y throughly checked the blanket for me and I put it on him for 4 days and came to the barn and it was perfect still! It's really beautiful on him and comfortable fit. it isn't too tight or loose. He got a very long coat this winter so this blanket worked great for not being too hot to over heat him. I saw a lot of people complained about the tear. If it does tear send it back and they will work with you like they did me. Billy is very rough on everything and he's done great with it! Thank you guys for being a great company that stands by their customers! This looks to be a nice light weight blanket for South Florida winter. Size was right on. Fits my gelding perfectly and looks nice. Was also perfect the next morning, no slipping or shifting. It's works great!!! My gelding was rubbing on some barbed wire and it has a few tears, but my mares is in 100% great shape! Lovvvve the color!!! Love the blanket, but dissappointed there was no Velcro on the front to help keep it closed. It was Tight for my horse in the shoulders, it almost seemed to be a mismade issue. The color blue with the black on the bottom was beautiful, wish it had fit My horse, I do think all turnout blankets should have the Velcro feature on the front closure where they buckle. The 450 denier was excellent as far as quality, seemed very durable. When this arrived it seemed just right. We have an 18.1hh friesen cross difficult to find blankets that fit. The medium weight kept him nice and warm and the size 84 fit perfectly. I had not read the full description about the lighter weight fabric not suggested for horses with turnout buddies that bite and sure enough on day 2 his buddy grabbed the back end of the blanket over a fence and tore both sides! I have sewed the torn spots and put duct tape over the seams. Hopefully that will hold for awhile. For the price and warmth and fit I would rate very high. But heed the warning about being easily torn! I only gave 3 stars for durability because our horse was able to bend the closures and the other horse was able to do some damage to the tail area of the blanket. I hope they make it through the winter - they are both very nice looking blankets and seem to run true to size. i own several, and this is an excellent price. I needed a lightweight turnout blanket for my senior horse and this one is a great price. My 15 year old daughter picked this out for her new horse. Good price! It was economical but very durable. These blankets have proven time and time again that they are worth the money and are a fraction of the costs of others that are the same quality. The price and it is supposed to be waterproof. I'll find out about the quality when I get it. I like the way you can adjust it. THEY ARE FOR MY PASO'S AND MY HEAVY WEIGHT ONE FITS THEM GREAT. Winter is coming and in Florida, a light blanket should be very useful. This blanket, the brand and the timing was good for me to purchase now. Also the discount and checkout price was good as can be had. Iknow it will be well used. I have this same blanket in 200g and have bought them for 6 horses. All the horses are out to pasture and I have never had a issue with them not holding up. My one horse is in a corral with no cover and we just had a storm with major down pour and his blanket held up fine, he was totally dry. I've had many of these blankets and they seem to work for all three of my horses! They are easy to wash and can stand up to most any type of weather. They are very good coats , I love the one that buckle under the belly . The oones that go inbetween the legs get cought up and tare or cause your horse to trip . very well made as well. recommended by friend whose horse is next to mine. Great fit, great price and great quality, thought this blanket doesn't hold up as well as the more heavy duty winter blankets I have from Tough-1. Still a great product. Great blanket! Keeps my older paint mare warm and snug even on days when the cold wind and rain wont quit. Fits perfect to measured size and is very durable. Good choice for a medium to lighter turnout blanket for a semi-active horse. price was right and i like the shoulder pleats. I love the quality of this blanket. Living in Wisconsin and have below 20 degree this year. I double layered the horse and they stayed warm. have one already. very pleased with it. good coverage on my horse. doesnt seem to shift around like other ones that i have had in the past. I've been using these for my other horses. They hold up well and keep horses warm and dry! Need a waterproof, lighter weight blanket and price is very important to me. This checked all the boxes of needs and wants. Great price on a lightweight blanket! Great previous experience with this brand. My horses are very hard on blankets and these are the only ones that last more than one season. have older horses, and these are light enough to use before temps get too cold. i use these more than their heavier blankets. also good for rainy days. It accompanies the neck cover for attachment. Have 2 other Tough one blankets in heavier weights and LOVE them !! I chose this blanket because it seemed a good value for the price. Quality for the price! Great color! Style we wanted. These sheets are warm enough for Northern California winters and waterproof enough to keep the horses clean when they're rolling around in the mud. It's actually nice to have some mud in California now. I bought this for my fast growing yearling. It was a great price, seeing as I know it will only last him a year. Tough 1 always re sells on ebay well too! They always have good quality at a great price. got these after the others didn't fit my small rescued horses. How do you measure our horses to get correct size when ordering? Thank you so much! my mare, at 15 hands, weighs in at 1270 lbs.. she measures at 79". should I get her a 78 or move on up to the 81"? Will this sheet be too heavy for 40-50 degree weather? And is this good for showing or trail riding? BEST ANSWER: This product would be best used in 20-30 degree weather. It is also not meant to use while trail riding. Will this keep my horse warm in 0 temperature weather? Is it waterproof? My horse is rather large, would just a sheet keep him warm or should I go with a light weight blanket? BEST ANSWER: This actually is a light to medium weight blanket. The grams are 150. BEST ANSWER: Yes it is waterproof. The fit is great. Color is true red. What size a blanket do I need for a 14.5 hand, 850 lb T. Walker? BEST ANSWER: I have a QH mare that is 14H and about 950lbs and wears a 70. Ive learned to actually measure each time I buy a new blanket as each is different and I think weights can change based on a number of reasons...saves a return and the disappointment of not getting to use your new blanket right away! ?? I have two Arabians lost to that size. I ordered the 69 inch and they fit perfectly. Straps are adjustable, too, so you can customize the fit to your horse's shape. I have a 14.5 hand, 850lb. TWH mare. I purchased a 68". Just measure like they say to. It fits perfectly. Is this water PROOF or water Resistant and how lightweight is it? BEST ANSWER: Hi. The blanket is very light weight & even here in CO it is the blanket I use the most...it is lightweight but very warm. Our barn isn't insulated so on really cold nights (like single digits) I use it as the top layer to a heavier blanket options. It washes up nice but definitely can NOT be put in dryer I melted the straps even on a low setting but I liked this light weight & pretty warm option I didn't hesitate on buying a new one. My horse doesn't live outdoors so I am sorry I can not properly answer the questions about how water resistant it truly is. Otherwise I love this blanket or rather my horse does. I ordered it !n inch or two bigger than I normally would & it can be the base layer (not too big) or top layer no problem. I would say water resistant if used as a turn out without any shelter. It really isn't all that light weight. It is a decent stable blanket. Since my horse can come in out of the weather he never got wet but I would not go as far as to call it water proof. It fits really well too. Hope that hellps. This blanket is waterproof. Have used the same blanket 2 years and washed it. Horse stays dry.Keeps horses warm in 20 degree weather just fine. Good in light rain. Medium weight and very sturdy. I would buy this blanket again. Not waterproof, just resists light rain. i have a 15.2 hand thoroghbred and she is 6. she is kinda on the skinnyier side. she measures 78inch, but should i get it a little bit smaller due to her size? BEST ANSWER: If she measures 78 inches from the center of her chest straight back to the edge of her hindquarters, then that is the size blanket you should probably purchase. The line on this blanket where the two colors meet is exactly where to measure your horse for size. I have a 15h QH brood mare. This is a very roomy blanket. Fits my girl even when she is very pregnant. I would go on the smaller side. Can this be put on during 40-45 degree weather? BEST ANSWER: Yes it can . I blanket my horse with it from 40-50 degrees and mine has worn well and seems comfortable. For weather in the 30's and 20's I use the 250 denier weight with snug-it fit. Love these blankets ! I use it on my gelding at those temps, but he has a thinner winter coat. The blanket is a medium weight blanket. I would not use it on a horse that has a thicker winter coat at that temperature. Yes, you can use this turnout blanket in 40-45 degree weather. I use one for my 30+ year old in weather much colder (20 to 25 Degrees) and sometimes warmer (50-60 degrees). Hi Daniele, Yes, this blanket can be put on during 40-45 degree weather. However; if it's not raining I don't put anything on my horse because she already has a "coat". I donâ€™t, but I only blanket my horses when itâ€™s really cold weather. This is a really good heavy warm blanket. Will this keep my horse warmer and is it wind proof? BEST ANSWER: The blanket is windproof, like a windbreaker jacket. It is not very warm so if you are in a cold climate (I am in Scottsdale, AZ) this is not heavy enough to provide much warmth. You need more than 150 g of fill. I replaced this blanket with a Dover Rider International this year - tougher fabric, higher fill content and more waterproof, but more expensive. This Tough-1 turnout is attractive and fits well but tore easily and had to be repaired the first week of use. We are in Colorado and we have the heavy weight blanket on our boy when it drops below 20 with snow and 30 MPH wind gusts he is good. I live in Georgia. I used this blanket often. If my mare needs a warmer blanket I layer. This blanket is perfect for layering. Yes, it's warm and dry. Does have wind protection. Not heavy duty but enough for a cold wet day of turnout. I love this blanket. It keeps my mare dry and warm. We have 50 mph winds here and she is comfy. I measured one of my horses at exactly 72in and the other one at 70 1/2 in. Should I get them both a 72in blanket or should I move up to the 75in for my bigger horse? BEST ANSWER: Blanket size reflects the measurement of one whole side of the garment; for this blanket, it's the line where the two colors meet. Usually it's best to go with the size closest to your horse's measurement, unless he is either particularly thin or particularly big-bodied. Measure twice to be sure. Use a cloth tape and two people for accuracy. I would always go a little bigger. In my personal opinion a few inches too big is better than being too small. My gelding measured at 70 inches and I bought him the 72 and it fits great! My 64" ponies are fine in 66" blankets but I add an inch for days they go out with stable blankets under them. I think they measure pretty true to size. They wear really well too! Would this be a good blanket for spring weather? Looking for something waterproof with a little warmth. It is a lightweight blanket for spring that is waterproof but if you have a lot of trees in your pasture it might not hold up well. Mine seemed to take extreme pleasure in finding every tree available and rubbing against it. So in two weeks it had a few holes in it. These blankets do well in spring when you want a little warmth but not too heavy. Outer shell is not as strong or tear resistant as some other higher end blankets but I have several that I use. I live in Oklahoma, the Tough-1 420 turnout blanket with 150g of fill is perfect for WINTER here. What is this blanket lined with? BEST ANSWER: I think it is polyester. I wouldn't buy anymore, though. Blanket is completely shredded, I switched to Rambo and Weatherbeeta, quality is not comparable. you get what you pay for. I really like mine. None of mine have been torn up at all. They stay on the horse well. Soft blanket nylon, silky smooth like a sleeping bag. It has a 210 Denier Poly Lining. How to measure sizes for turn out blankets? BEST ANSWER: Measuring instructions can also be found under Product Summary on the item web page. "Measuring Instructions - Stand your horse as square as possible, measure from the center of chest around side of the body to the point of the horse's rump just before the tail. If you horse ends up measuring between sizes always round up to the next size to ensure full coverage. " Posted on website. Mid-chest olong flank to between legs. Will a hood connect to this? BEST ANSWER: There are "dee" rings on each side at the shoulder so you can attach a hood. Additional rings (ie, at withers) could be added by tack repair shop. Not on the one I have. Just a nice heavy strong blanket. Will this be a good fit for my Morgan? BEST ANSWER: Yes, if you measure from chest to end of hip as a site will show you, the body length down around his body shouldnâ€™t overwhelm a ?Morgan. Stay away from the Horze brand as they tend tho run big as in warmblood sizes. Hope this helps. I agree with above answer. I have a big Arabian stallion 15.2h and 1000 lbs . It is a great fit for him. I bought him a 72" and am very pleased. Yes if they have the size you need? It's a light warmth blanket. It's nice and light. I have one for my paint and I love it.